Caritas Kasuas, Sue Draper, student Kamomrat Lloyd and Arpita Shah. 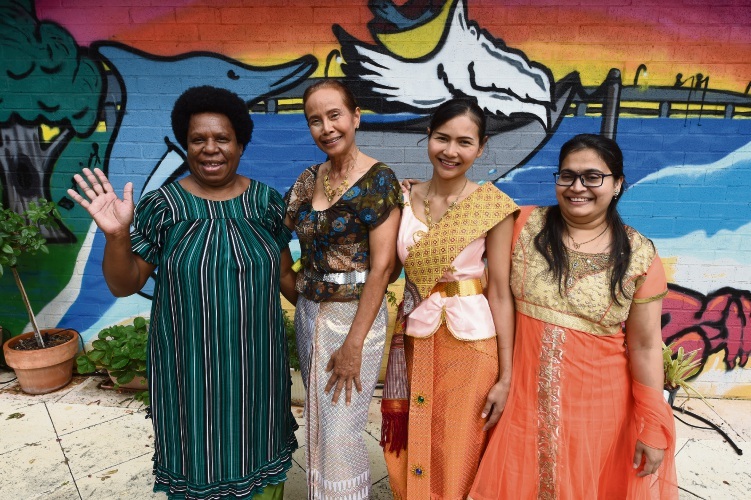 FROM India to Indonesia and everywhere in between, the dozens of different cultures that make up Mercy Health will be celebrated on Harmony Day on Wednesday. The day’s inclusive multicultural message rings strong at Mercy Place, Halls Head where staff and residents represent more than a dozen different countries. Team members will kick off the celebrations with a special morning tea organised by staff who will be talking to residents about the traditions found in their home countries, with staff attending in national costume and bearing dishes from their countries of birth. “Our home is almost like a small United Nations as we have people from a range of countries all of whom are looking forward to seeing each other in traditional dress , whether its kimonos, saris, Hawaiian grass skirt or even Aussie shorts and bush hat.” service manager Christina Venables said.